This blog article is a companion to this youtube video on my channel. Despite all their limitations, I like the Cheerson minidrones. They are inexpensive, rugged and fit into any jacket's pocket. So they're ideal to take with you on a walk and are great to teach the kids a thing or two about flying. Being a licensed pilot myself (well - for paragliding, that is ), I simply enjoy the occasional flight. CX-10A which is a headless version of the above. The headless mode (tap the left stick 2x) takes a lot processing power off the pilot's brain and makes flying easier for the kids. "It doesn't have a camera, does it?" "Naah, no way. That thing can never possibly carry a camera"
Little did I know that only a few months later, the world's smallest camera drone hit the market. Once the price was down below the magic (German customs regulation) 22€ mark, I ordered one straight from the PRofC. It also has a CE mark on the box, which means it won't get stuck in customs for safety / EMI reasons. Last week I was delighted to find that CX-10C drone in my mail. It is a little higher that the CX-10 / CX-10A and significantly heavier. I inserted a FAT32 formatted 2GByte micro SD card. - The card's contacts have to face UP when inserting. To my amazemt, the charge current drops to zero then the LED goes out. So the battery doesn not overcharge. I took it to a nearby park for a first test. The first thing I noticed was the sluggish climb rate. The CX-10/A responds far more aggressively to the throttle. Pitch and roll are very low in the default ("junior") mode. 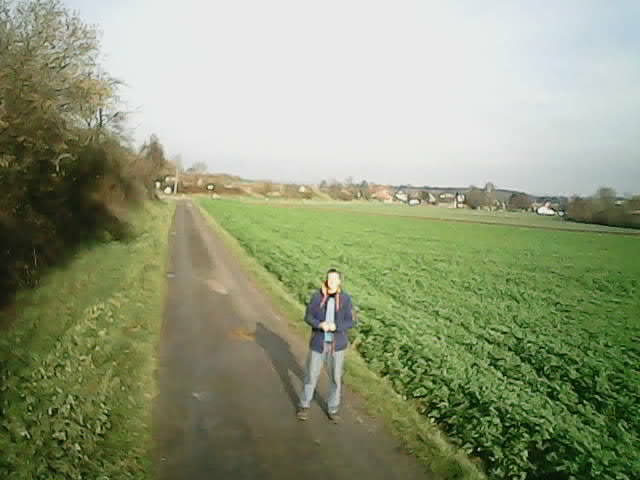 That is great to get stable video recordings, but the copter will be blown away even in light winds. During flips, the drone loses about 1 to 1,5 meters of height. In the older, lighter models this was very well compensated. It is still amazing that it still works, given the increased mass of the thing. The stills are obviously not great. See my youtube video for some of my recordings. Videos appear over-sharpened to me, which makes the 640x480 resolution appear better than it actually is. If the sun is low on the horizon, colours are a bit washed out. It is amazingly good in low / artificial light. No camera gimbal, so any front/back/side movement will make the viewer seasick. No headless mode. That would make it easier to concentrate on shooting video footage. Yes, you want that. It's fun and it's cheap. I bought one. After charging I managed to get it to fly for about 2 seconds and than it stopped working. I had to turn off everything and go through the steps to start again. I can't figure out what is wrong. Any help will be appreciated. You should get at least 20m range and a few minutes of flight time. I read one report where the antenna wires had been coiled up in the enclosure (rather than being stretched out) which strongly affected the range. 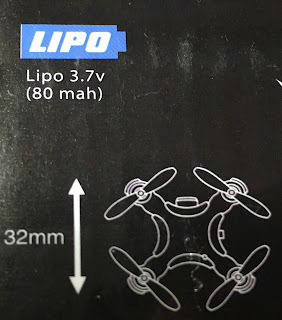 I own quite a few minidrones and the build quality is far from perfect. I had poor solder joints and pinched wires, all of which was repairable. But if you bought it new, I'd first ask for a replacement/refund before ripping it apart. The dealer will probably want a video showing the problem as proof. I had a couple secs if flight time and the dealer sent me a new unit. It now flies for about 2-1/2 minutes.